DivePhotoGuide Awarded Best Website At Prestigious World Festival Of Underwater Images, Antibes. Nov 3, 2008 (New York, NY) – Popular underwater photography & video portal DivePhotoGuide has been presented with the best website award at the 35th Annual World Festival of Underwater Images, one of the most prestigious underwater photo & film festival in the world, held annually in Antibes, France. DivePhotoGuide provides daily news, featured articles, product reviews, PRO and featured member photo galleries, competition calendars and amore. Although the emphasis in underwater photography and video, there is an additional focus on all issues scuba diving and ocean related and all the members of the DivePhotoGuide team are active supporters of the marine environment. The website has since undergone a couple of significant facelifts and overhauls and continues to evolve. DivePhotoGuide.com launched in March 2005 and was founded by internet agency entrepreneur Jason Heller. Thanks for posting this news Stuart, we were honored to win this award. Congrats on your great blog. 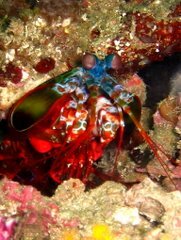 I always love reading blogs from folks on the ground at a dive destination such as yourself. Keep up the good work.